Never let small children carve pumpkins. Let them draw the face if they want, but adults should handle the knife. If you use a candle to light your pumpkin, make sure it is securely in the pumpkin. Never place a candle-lit pumpkin near flammable material such as curtains, and never leave it unattended. Consider using a battery-powered light rather than a candle to light your pumpkin. If a child’s costume includes a sword or knife, make sure it is short and flexible. Avoid masks, which can impair vision. Instead, use non-toxic makeup. If hats or wigs are part of the costume, make sure they fit properly and don’t slip over the child’s eyes. Costumes should be bright and easy to see. Consider adding some reflective tape to costumes and/or treat bags. Avoid costumes that are too long or shoes that are too large; both can cause tripping. In general, make sure costumes fit correctly and allow the child to see clearly and move comfortably. Adults should not use decorative contact lenses without a prescription from an eye care professional. Even though the packaging may suggest that an eye exam is not necessary, you can seriously damage your eye with decorative lenses. Choose or make costumes of flame-retardant materials. 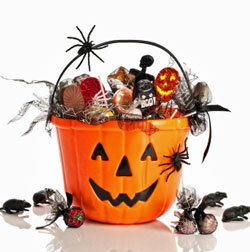 Children, especially young children, should always be accompanied by a responsible adult when trick-or-treating. If you allow older children to go out on their own, make sure they understand where they are allowed to go and when you expect them to be home. Each child should have a flashlight, and each group of children should have a cell phone, especially if they are older children out alone. Don’t go to houses of people you do not know, and don’t go to houses that don’t have their lights on. Never enter the home of someone you don’t know. Remind your children that drivers might have trouble seeing them, especially in the dark. Make sure they cross only at corners or crosswalks, avoid busy streets and always look both ways. If you are inviting trick-or-treaters to your home, turn on your porch light and other house lights. Remove things that children could trip on, such as wet leaves, bikes, hoses, etc. Keep any pets inside and away from the door. You don’t want your pet to dash out the door or to scare the children. Make sure kids eat a healthy meal before they go out on Halloween. Don’t let them eat the treats until they have returned home and you have examined the treats for signs of tampering. It is best to throw out homemade or unwrapped treats unless you know the source of the treats well. Place a limit on the number and type of treat your child can eat immediately and in the days following Halloween. And in general, be on the lookout for suspicious activity; unfortunately, some people take advantage of the holiday to commit vandalism or other crimes. If you see something that makes you uncomfortable, call the police.